A skull from a male skeleton, showing at least two blunt force trauma impacts, probably from a club. The history of humanity is a history spattered with blood. Our ancestors were killing each other hundreds of thousands of years ago. Now the oldest massacre in history has been discovered in the fossilised bones of at least 27 individuals unearthed at Nataruk, 30 kilometres west of Lake Turkana in Kenya. The group of nomadic hunter-gatherers, found by the Cambridge University’s Leverhulme Centre for Human Evolutionary Studies, contains 12 relatively complete skeletons, some of which displayed very obvious signs of violence. 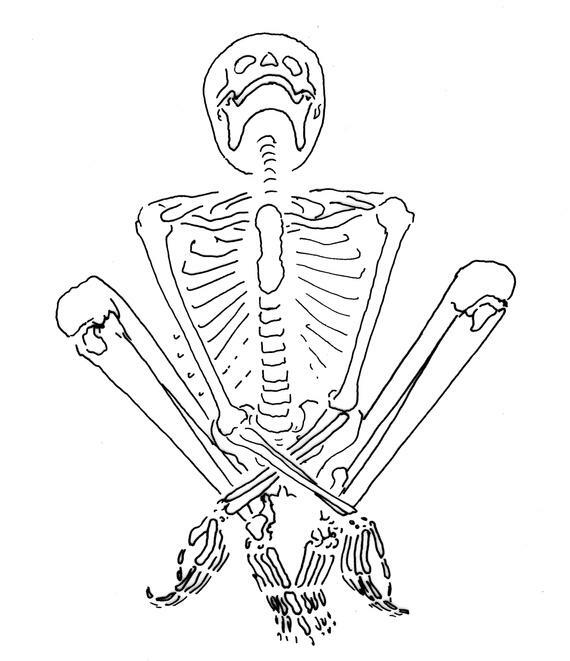 Broken bones in the skull, hands, knees and ribs indicate blunt-force trauma, while other marks on the bones indicate the use of stone arrows. Most of the skeletons had severe cranial trauma. The research has been published in the journal Nature. One man had an obsidian stone projectile tip embedded in his skull and another in his thorax. Obsidian was rare in the region, which suggests that the attacking group was from elsewhere. Included were the bones of at least eight women and six children, some of whose hands were likely bound, as indicated by the position in which some of them were found. One woman was heavily pregnant, found with the tiny bones of a foetus in her abdomen. Several of the skeletons were found face-down. None were buried. 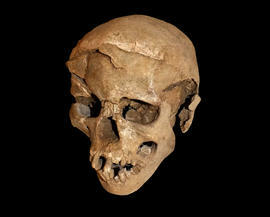 The scene, the researchers said, is the earliest record of rivalry and violence between groups of prehistoric hunter-gatherers. Radiocarbon dating was used to date the massacre to 9,500 to 10,500 years ago, around the beginning of the Holocene following the last ice age. “The deaths at Nataruk are testimony to the antiquity of inter-group violence and war,” said Cambridge University’s Marta Mirazon Lahr, who directs the IN-AFRICA Project and led the Nataruk study. The pregnant woman’s skeleton was found in a position that suggests her wrists and possibly ankles were bound. The region at the time was fertile. It contained a lagoon. Several of the skeletons were found in the sediment. It also contained marshland and vegetation, bordered by forests. Evidence of the human life the area supported includes pottery. In evidence found of later battles, clans would sometimes clash, the men killed, the women and children integrated into the conquering clan. Not so the Nataruk massacre. Of the 27 skeletons, eight were determined to be male, eight female. Five were adults of indeterminate gender. The children’s bones were not found near any of the men’s bones, and most of them were under around 6 years of age, with the eldest somewhere between 12 and 15. The evidence of trauma was clear. Ten of the skeletons showed wounds that would probably have been instantly fatal, five blunt-force head wounds and five confirmed arrow wounds. Although the reason for the massacre will never be known, it provides evidence that humans warred on each other from the early hunter-gatherer days.